In his recent Ellis Island address, Gov. Cuomo declared, ‘“[Our] credo is not only do I Love NY, but New York loves you.”’ Unfortunately, with respect to unborn children, the passage of the Governor’s long-sought abortion expansion bill proves otherwise. While various abortion expansion bills have passed the Assembly for many years, the Republican-led New York State Senate has blocked these extreme, unnecessary, and callous bills for over a decade. 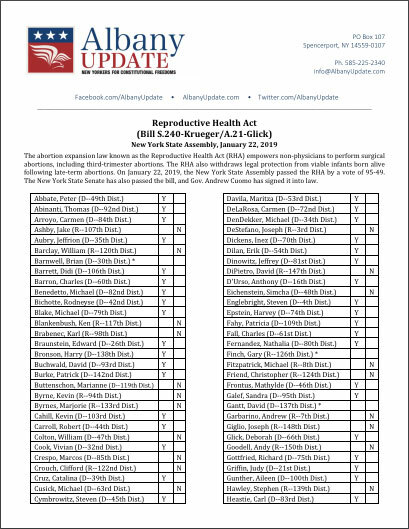 Sadly, a majority of the current Senate—led by Senate Majority Leader Andrea Stewart-Cousins (D-Yonkers)—supports the RHA. By passing the RHA, the State of New York has embraced the proposition that some living human beings do not deserve the protection of our laws. This proposition flies in the face of our American tradition of respect for human life. Without the right to life, the other rights guaranteed in the Constitution have no meaning. Contrary to the rhetoric of RHA advocates, abortion access does nothing to advance the rights of women; rather, it invites both women and men to view unborn children—their own unborn children—as disposable objects. Instead of celebrating the passage of the RHA as a milestone, New Yorkers for Constitutional Freedoms views the passage of this bill as an occasion for mourning. Our state needs a course correction—not just legislatively, but also morally and spiritually.